Since the fall of the Gupta Empire, the subcontinent of India has once more fallen into a disunity and chaos to be expected of a land so layered in peoples, cultures and powers. From the ashes of this world has risen a new martial people of ancient lineage but newfound glory: the Rajputs, differenciated by the normal Kshatriya by virtue of their very name's definition - "Son of a King"./n/nNot merely the sons of royalty, the Rajputs trace their lineages (vanshas) back to one of three heavenly Patriarchs: The Suryavanshi of Surya (The Sun God), The Chandravanshi of Chandra (The Moon God), and Agnivanshi of Agni (The Fire God). From these three noble bloodlines descend 36 main clans or Kulas, which in turn divide further into various branches. Nobility of spirit and prestige of rule is not a virtue exclusive to any one bloodline, great dynasties of past and present possessed by all three lineages. Yet at least in Northern India it is the Agnivanshi who stand tallest this day, with the great kingdom of Chauhan in Delhi and the Paramara of Malwa poised for dominance of West and North Indian soveriegnty./n/nThough the whole of the Rajput people have taken to the equestrian arts far more than the Indian dynasties before them, it is amongst the Northern Rajputs where the Agnivanshi reign dominant that thrones are won not by the might of elephants but horses. It is said that there are three things must you never ask of a Rajput: His horse, his mistress, or his sword. By the merits of two of these things has the Rajput become the defacto warrior of India, challenged only by tradition's demand of the elephant and the rising threat of the Turkish horse archer and cataphract./n/nAs men of privilege and status afforded by their martial skills these Rajputs possess superior armor to what many of their brethren hold, being little or most often nothing. Such heaviness does not hinder their service as mobile, fleet-hoofed cavalrymen but does grant them a greater durability. Their arsenal is a light stabbing spear, sharp forward-swept sword and round Indian shield, befitting their role as light charge-based cavalry. 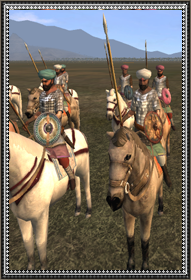 Whether committed to a zealous rush to engage their enemies up close or mimicing the Arab Razzia practice of charge-retreat, their medium armor and nimble steeds serve well in a mobile light-medium cavalry role.